First, my warm congratulations on behalf of the Chinese Embassy on this meeting in Wales of the China-UK Joint Economic and Trade Commission. I am delighted that this meeting also marks the opening of the SME Forum. 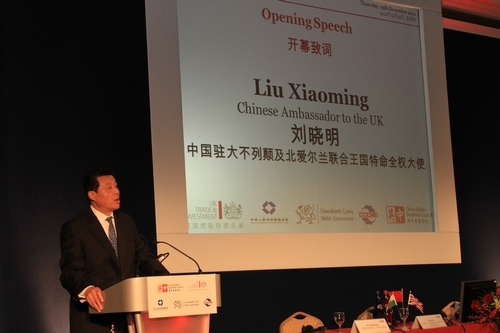 When I arrived in the UK as Chinese Ambassador, one of the first events I attended was linked to SME promotion. Since then I have observed the vital role that SMEs play in creating economic growth in our two countries. Another key economic driver is the collaboration between China and Britain. In recent months I have felt a marked strengthening of Sino-UK economic and commercial relations. One measure of this trend is the ever deeper dialogue and engagement of top officials in both China and Britain. I could see a significant increase in exchanges to explore cooperation and opportunities in the past couple of months. · In early September Vice Premier Wang Qishan co-chaired the China-UK Economic and Financial Dialogue in Britain. 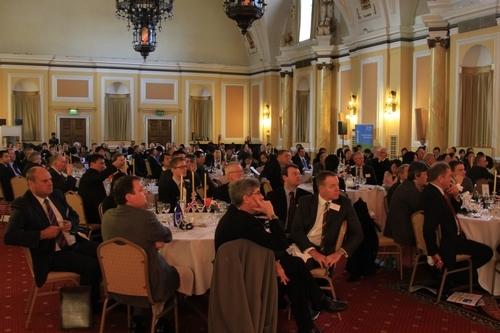 · In October First Minister Carwyn Jones led a big business mission to China. 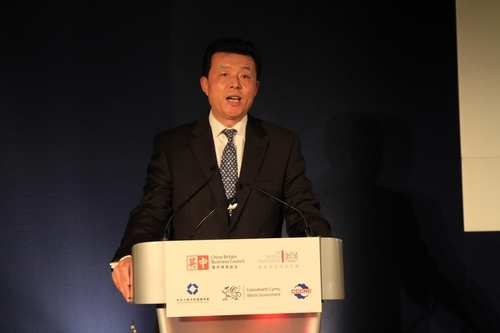 · Last month China and Britain held the Infrastructure Investment Conference in London. Over 200 business leaders from our two countries attended. · In early December the First Minister of Scotland, Alex Salmond, brought a large trade delegation on his visit to China. · Also, we had an IPR symposium and offshore wind power seminar in recent weeks. Today is another good example of the vitality of this economic partnership. Our agenda today is packed with meetings. In addition to the 10th JETC and the SME Forum, our Infrastructure Task Force will also meet. Through all these activities, our business links are on course to be more productive and better structured in three ways. · First with the plan to boost the two-way trade. · And second, progress to win support of Chinese investment in infrastructure and other sectors in Britain. In June Premier Wen Jiabao and Prime Minister David Cameron agreed to create a bilateral investment promotion task force. In addition was the setting up of the SME Forum to lend new momentum to our commercial links. · Green energy and environment-friendly industries. At this JETC meeting the two governments have pledged a better policy environment to enable our business communities to cooperate. It all adds up to a strong pro-business climate emerging from such strong leadership and support from government. Second, strong and balanced growth in trade and investment. In the first 11 months this year, our bilateral trade jumped to 53.2 billion US dollars. That is a rise of 18 percent. In the current global economic environment I believe that is a commendable achievement. What merits more attention is British exports to China. These have risen by 30 percent from January to October this year. This is on top of an impressive 40 percent growth in 2010. British investment in China remains in a strong lead among EU countries. What's also encouraging is the faster pace of Chinese investment flowing into Britain. Statistics show China's greenfield investment in Britain has risen to close to one billion US dollars. Furthermore Chinese companies' equity purchase and merger and acquisition deals in UK have amounted to five billion US dollars. Third, wider regional outreach and diverse market participants. Wherever I visit in Britain I sense a strong passion to build stronger commercial links with China. Here in Wales this enthusiasm is led by First Minister Carwyn Jones. In Scotland this energy is matched by First Minister Alex Salmond with strong efforts to strengthen our trade and investment ties. In China, similar enthusiasm and energy are shown by governors and mayors from various regions. But the most important drivers of our growing ties are countless businesses that operate in China and across Britain. Big firms are obviously leading the way. But SMEs as the 99% are a critical component. That is why we have launched a Sino-UK effort to unleash the SME potential. The SME Forum being held today is an important part of this initiative. The objective is to share information, build cooperation and produce mutual benefits. Four days ago the 11th of December marked an important anniversary in China, namely China's 10-year membership of the WTO. Joining the WTO was a watershed moment in China's history. The celebration of those ten years was a happy one. Joining the WTO has been a great success. We believed so ten years ago, and we believe so now. Our economic success is only possible in an open world and based on win-win partnership with others. Ten years on, our WTO story has reinforced this argument. On our way to prosperity and free trade, Britain has proven to be an important partner. We treasure all that has been achieved between us. In this spirit we seek to deepen our win-win cooperation in trade and investment. I'm convinced that this is the true path toward the shared prosperity of China and Britain. In closing, let me congratulate you once again on the successful JETC session and wish you an equally successful SME Forum.